Queens NY May 16, 2015: It seems like four scores and sixteen years ago since the Mets were streaking back when they won 11 games in a row bringing them to (13-3). The Mets were the talk of the town as they were “clicking on all cylinders”. 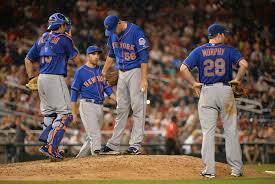 A lot has transpired since that hot start the Mets are streaking yet again only in the wrong direction. Since their (13-3) start they have went just 7-13 since holding a slim half game lead over the Nationals. The Mets earlier in the season could not do no wrong collecting two out hits to go along with high caliber pitching helping them overcome all injuries and losses suffered early on. But in their last 20 games they cannot get it together squandering what could have been a series split with the Chicago Cubs but lost the last two games in the late innings. There is no bright spots along with no good news for the Metropolitans as Dilson Herrera one of their prospects was the latest to hit the disabled list with a fractured finger. The Mets at one point had the cream of the crop with their young pitching prospects but with all their injuries sustained lately what seemed to be young prominence is suddenly no promise. Tonight’s game was just an embarrassment all around the Mets lost 7-0 to the Milwaukee Brewers. Yes to the 13-23 Milwaukee Brewers and to add more disappointment the Mets offense could not muster anything against Kyle Lohse who pitched 8 innings of shutout baseball holding the Mets to just two hits. Bartolo Colon finally looked his age getting roughed up for 6 runs on 5 extra base hits in five innings of work. Ryan Braun had 2 HR’s in the game bringing his total to 8 on the season. The Mets just continue to lose all around as there is no good news from the injuries suffered earlier this season David Wright still has no timetable as to when he will rejoin the team. The Mets look to stop the bleeding when they send Jacob Degrom to the mound tomorrow following with top prospect Noah Syndergaard and then the Dark Knight himself Matt Harvey on Monday. Degrom has had a few shaky starts this season but continues to show brilliance in his second year with the Mets. The unexpected superstar looks to get back to his dominant form and halt the losing streak at 5 games. Noah Snydergaard whom the Mets are calling Thor looked like a demigod on Tuesday when he pitched lights out against the Cubs before exiting after 5 1/3 innings. Matt Harvey had a magnificent night on Thursday pitching 7 innings of shutout ball against Chicago before the Mets relinquished both the lead and the game after he exited. The Mets need to wake those sleeping bats up if they look to go in the right direction this year. You can have the cream of the crop pitchers but if you cannot hit the ball you might as well have no pitching at all. If the Metropolitans don’t fix it now and fast they will see that post season drought extended to nine.